The soundpost is an integral part of any stringed instrument. It serves multiple purposes on the bass: as a structural device to support the top, a vehicle to transfer longitudinal vibrations from the top plate to the back table, and as a mechanism to restrict open and uncontrolled vibrations within the top and back table as well as the ribs. Soundposts are tradi­tionally made from vertical grain spruce of the quality of fine instrument top wood. The density or hardness of the wood varies greatly, as does the diameter of the post and the number of grains within its end diameter. All these factors result in different reso­nances that in turn have an effect on the sound of the instrument. I am often asked how to accurately fit a post into a closed instrument. Like the player who asks how to get to Carnegie Hall, the answer is: ‘Practice, Practice, Practice’. All qualified repairmen have had their share of failed attempts to fit a post into a bass. It takes years of experience to develop that ‘sixth sense’ of fitting it correctly the first time around, as well as knowing how to choose the proper quality wood to cut it from. 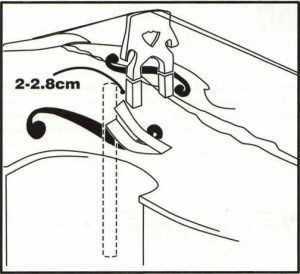 The fit and position of the post are important variables – how accurately and tightly it is fitted within the instrument and its position relative to the G string side foot of the bridge will both affect tone. As a general rule, the soundpost is usually centered behind the treble or G foot side of the bridge and placed approxi­mately 2 to 2.8 cm behind the back side of this bridge foot (see diagram). Every instrument reacts differently, so wood type and density of the soundpost will create different results from bass to bass. I generally try to pick a soft or low-density spruce post with approximately 12 to 14 grains on the diameter. However, this choice can change if there is a particular problem with the instru­ment that, in my opinion, would be corrected by using a different quality of soundpost. As with any wood component of a stringed instrument, seasoned wood is desirable – to the point where I often salvage the centre section of an aged, quality bass bar that is about to be replaced. This will generally produce a seasoned, resonant soundpost that, when fitted correctly, will yield a V complimentary tonal quality. There is much debate over the pros and cons of a tight or loose post. From a structural viewpoint, the soundpost contributes to the support of the top table. 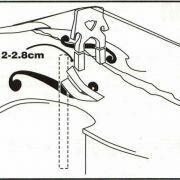 Too loose a post can result in the top of an instrument distorting and sinking to a small extent, espe­cially if the bass has a thin, flexible top. It will also contribute to a shift in position of the post itself, through vibration during playing or even from transporting the instrument, thus affecting its tonal stability. Too tight a fit can result in distortion of a fragile top table and, worse, a soundpost crack. A post should never be so tightly fitted that it is forced into the upright position, as this can compromise the structural integrity of the instrument. The soundpost should always be positioned inside the instru­ment with the grain on the end of the post perpendicular (at a 90-degree angle) to the grain on the top table of the instrument. A general positioning rule is that the further back it is from the bridge, the less of a restrictive effect the post will have on the tonal qualities of the instrument, producing a darker sound in most situations. If this is taken too far it will result in an unfocused tone lacking proper definition. Conversely, a tight- fitting post positioned close to the bridge will generally result in brighter tonal qualities. These, of course, are general statements: each instrument has unique requirements based on the material used to make the post, as well as its position and fit. Another question is the frequency with which you should adjust the soundpost. Adjusting it too often will be more of a detriment than an asset to the instrument’s sound and overall health. It is a wise idea to have the soundpost adjusted at least once a year, perhaps coordinated with string replacement and other maintenance. However, an instrument that is heavily affected by climate may require several adjustments during the year. In general, string height drops in cold, drier weather and rises in warmer, more humid conditions. Adjustable bridges enable players to compensate for this at will. As the soundpost is a constant length, changes in the distance between the top and back table due to movement in these plates with climate change can result in the soundpost being too tight, with the risk of struc­tural damage to the instrument; or too loose, causing instability in the bass and making the post shift out of its proper position. Periodic adjustment by a qualified repairer will often eliminate or de-sensitize tonal problems, including evenness of sound, projection, and wolf notes, which are a necessary evil on any fine caliber instrument. Wolf notes are by definition a convergence of overtones. The more overtones an instrument has, the better sound quality it affords and the challenge for the maker or repairer is to isolate a wolf note to a less prominent area of the bass. This can be accomplished by simple soundpost adjustment, or more complex relational tuning of the top and back table of the instrument, including graduation of the plates and bass bars. There is an old saying that if a bass does not buzz, it is not a good bass. By the same token, if the same bass does not have a wolf note, it is also not a great instrument. Use the wolf to your advantage – it is a mark of quality! Many thanks Barrie. A really interesting article. Video: A Magical Evening Of Performance and Conversation With Máiréad Nes... Summer Maintenance!